For gamers looking to up-level their graphics capabilities with ground-breaking technology, Radeon RX Vega 64 air-cooled cards are available today with Radeon RX Vega 56 GOUs, the most affordable way to get into enthusiast-class gaming on “Vega” architecture expected to be available August 28th. Radeon RX Vega graphics cards are the most advanced consumer graphics cards in the world, built on the “Vega” GPU architecture. Previously reserved for high-end graphics products, Radeon RX Vega graphics cards employ pioneering graphics technology in High Bandwidth Cache composed of 8GB of leading-edge HBM2 memory. The gaming-focused AMD Vega GPUs are launching today, August 14, with three different SKUs… one being ‘the world’s most powerful sub-$400 GPU’. “The biggest improvement in our graphics IP in the past five years.” Vega promises a host of improvements, including a new memory caching system. 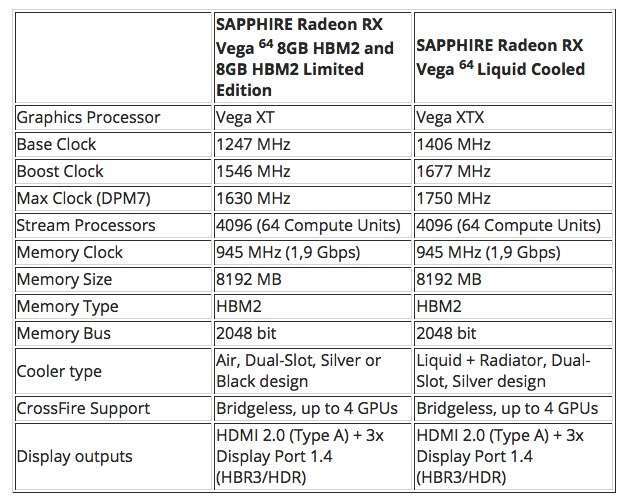 The Vega GPU is built on 14nm silicon with the lower-end RX Vega 56 sporting 3,584 GCN cores and the RX Vega 64 and RX Vega 64 Liquid each rocking 4,096. The air-cooled Vega Frontier Edition is on sale for $999, with prices of the RX Vega cards ranging between $599 for the top GPU and $399 for the basic Vega. The pro-level Frontier Edition delivers between GTX 1070 and GTX 1080 gaming performance, but AMD is targeting ~GTX 1080 speeds for the RX Vega. It’s been suggested by an MSI representative that the RX Vega is going to need a lot of power, with a 1KW PSU recommendation for the top version of the GPU. Gaming performance :SAPPHIRE Radeon RX Vega 64 graphics cards are the new high-end models of the Radeon family, we know you’ve been waiting for. The time has finally come to showcase the performance of Vega in the most important category of software on the planet: Games. Spoiler: it’s fast. Like, Ultra-details and VR Premium-fast! Extreme Gaming : Step up to next generation SAPPHIRE Radeon RX Vega Graphics cards and lose yourself in the greatest high-end gaming and virtual reality experiences. Escape inside the latest graphically intensive games with high framerates, ultrawide immersion, and Ultra HD resolutions. SAPPHIRE Radeon RX Vega graphics cards have been built with an extensively redesigned and forward-thinking GPU architecture to deliver exhilarating performance in the newest DirectX 12 and Vulkan games. Cinematic VR : Experience beautifully rich and immersive VR environments and gameplay, augmented by player comfort and effortless compatibility. With ground-breaking GPU multi-threading hardware, gamers can enjoy the smooth visual and audio presence that enables the perfect VR Experience. The SAPPHIRE Radeon RX Vega graphics cards deliver a fully immersive and comfortable VR experience. Intense Visuals : Crank up your graphics quality and bring out every detail at incredible resolutions with the revolutionary Vega architecture. The SAPPHIRE Radeon RX Vega graphics cards power the latest displays and features forward-thinking features like FreeSync 2. Play in lifelike HDR, stream your gameplay for the world, and record your highlights all at the same time with virtually no performance loss.